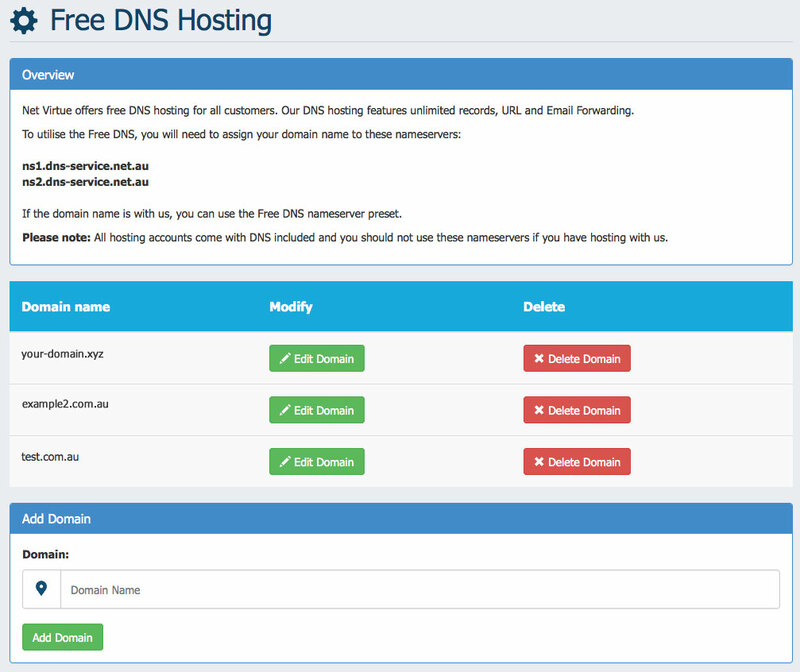 If you have your domain name with us, Click here to see how to change your Nameservers to Free DNS. 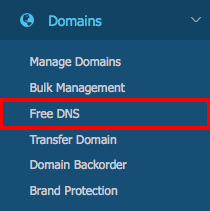 In the menu to the left of nvArea, click Domains to open the drop-down menu and then click Free DNS. This will bring you to the Free DNS Home Page. 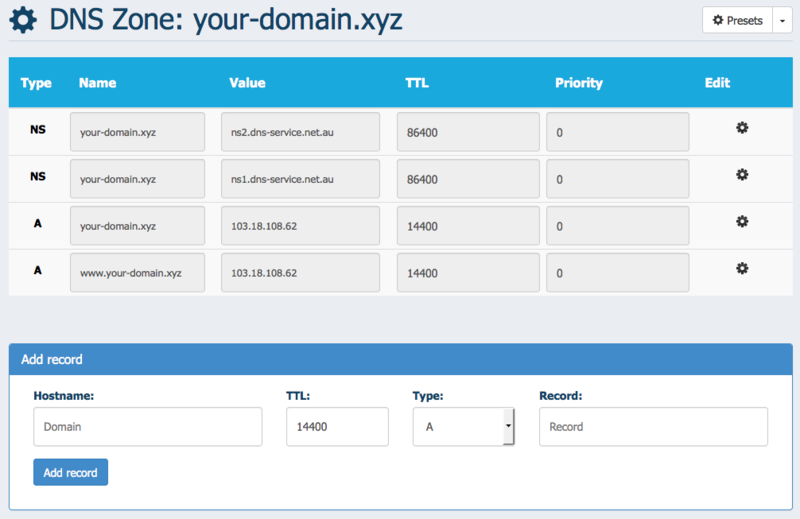 Here you will see any existing domains you have listed and also the ability to add a domain. To add a new Domain, simply type your domain name in the format of your-domain.xyz (Note: no www. or http:// etc) then Add Domain. This will add your domain name to the list above. Next we’ll need to Edit Domain to get started with the DNS Zone Records. You will see we’ve already added a few essential DNS records by default. From here, we can add, edit and delete records. Please do not remove the 2 NS records listed as otherwise Free DNS will not know it’s responsible for being the nameservers for your domain name. A: Address record — The address record assigns an IPv4 address to a domain or subdomain name. An A record will always be an IP address. AAAA: IPv6 Address record – The record AAAA (also quad-A record) specifies IPv6 address for given host. So it works the same way as the A record and the difference is the type of IP address. MX: Mail Exchange record — The MX record state the location that mail directed at the domain will be sent. MX records should always be fully qualified domain names, never just an IP address. Multiple MX records are typical with the ‘Priority; value specifying in order of preference of which mail server to connect to first. CNAME: Canonical name — The CNAME record makes one domain name an alias of another. The aliased domain gets all the subdomains and DNS records of the original. To put this in simple terms, a CNAME redirects requests to another record. A CNAME record will always be a fully qualified domain name. TXT: Text Record — A TXT record allows an administrator to insert arbitrary text into a DNS record. The most common implementation of TXT records are for adding SPF records to a domain. SRV: Service record -A SRV record is a specification of data in the Domain Name System defining the location, i.e. the hostname and port number, of servers for specified services. NS: Nameserver record -The NS record specifies an authoritative name server for the given domain name. URL: URL record – Allows you to forward your domain name to another domain name. EMAIL: EMAIL record – Allows you to forward an email address to another email address. Hostname: This is the domain name with and without subdirectory names. Type: Per the DNS records types above. Record: The value you wish to enter. Priority: This will only appear when MX record is selected.